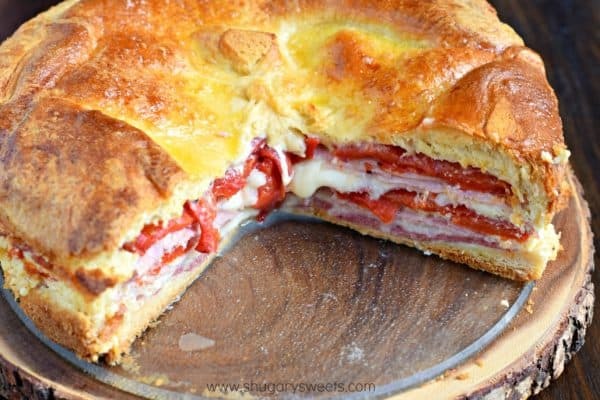 Delicious, easy, Italian Sandwich Torte: perfect for brunch or a weeknight dinner! Is it wrong to have a sandwich for dinner? Good, I didn’t think so either. The best part of this torte is it can be eaten warm, cold, or room temperature. So, I made it, and by the time we ate dinner it was room temp, and delicious. I had meant to make a second layer of spinach, but forgot. There should be a layer of green at the top! Mom, if this looks familiar, it’s because I took your recipe for Italian bites that you normally make in a 13×9 and baked it in my springform pan instead. It turned out so pretty! I cut the torte into 12 slices, and we ate it all up (well, we did leave two behind, but we gave it a good college try). Anyways, make this today. Tomorrow. Or make it the next time you have company. So good and easy! Heat oven to 350 degrees. Unroll one package of crescent rolls and line the bottom of a Springform Pan. Cover roll with half of the spinach, salami, provolone and ham. In a small bowl, lightly beat together 6 eggs and parmesan cheese. Pour half evenly over top of ham. Top with half of the roasted red peppers. Repeat layering with remaining spinach, salami, cheese, ham and egg mixture, then peppers. Top with remaining package of crescent rolls. Lightly beat remaining egg and brush over top. Cover with foil, bake for 30 minutes. Uncover and bake an additional 30 minutes. Remove from oven and allow to sit for about 10 minutes. Run knife around edge of pan, remove springform pan. Cool for 30-60 minutes. This can also be made in a 13x9, following the same directions. Allow to sit 30-60 minutes before slicing. Enjoy! Enjoy! It is very very good! Finally made this and it was great. I used pepperoni in it to and it was a big hit. Thanks for the recipe! GREAT new recipe using one of our favorite ingredients…crescent rolls! They’re such timesaving heroes in our kitchens. Oh my goodness this looks fantastic. I want to eat it right now! 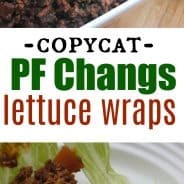 Can across your post on Facebook & cannot wait to try this recipe this weekend. Thanks for sharing! Just wondering how far ahead of time this can be assembled…. Thoughts? nothing wrong w/ sandwiches for dinner at all! my Mom used to make good ol’ grilled chees & soup for dinner & so do I ; tho I did make ’em fancy last time & added bacon & grilled cheese & apples is good too 😉 this looks awesom,gotta make it soon! Define travel? If you want to take it to a neighbor’s or a brunch, yes. Long car ride, probably not. Baking in a 13×9 dish might be easier for travel! What is a “springform” pan? And are you using the crescent rools in the tube (like the canned bisquits? A springform pan is one you would typically make cheesecakes in. However, you can use a 13×9 baking dish as well. And yes, the crescent rolls in a tube…just unroll (don’t separate). ENJOY. We made this sandwich tonight and it was the best sandwich I have eaten in a long time. I am going to share the recipe with everyone!!! Excellent! Dawn, I’m so glad you enjoyed the recipe. It’s a favorite in our house too!!! Mm.. I have this in the oven right now! Mum inlaw is on her way up for lunch. Hoping it turns out great. Thanks for the recipe! Enjoy Emma! Be sure to let it set for a bit after removing from the oven!! I made this a couple months ago, and it was excellent still warm, and also cold straight from the fridge. I’ll be making it again this week, since I just received some spinach and onions from a co-op. (Instead of using a jar of red peppers, I saute green bell and an onion with garlic and throw that in). I LOVE this recipe. It’s a definite “go-to” on a busy week, because it’s easily 8 servings, and with only 2 people it is lunch for a few days after. Thanks for sharing! Thank you for coming back and letting me know! It’s definitely a versatile recipe, we’ve changed up the lunchmeat and veggies and it’s delicious!! Looks so good! What size springfrom pan did you use? I believe mine is a 9inch….but I’d have to double check. An 8 inch would totally work too…either one. Do you have to let it rest that long if you want to eat it warm? The egg and parmesan mixture really binds this dish together! Could you use pizza dough or something other than crescent dough? Not a big fan of crescent dough in savory items. 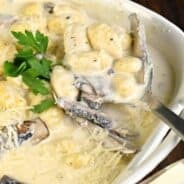 Thoughts on cooking time with a substitute? I would use the 9×13. Any idea of the nutrition, calorie and protein count on this? I’m sorry, I don’t calculate the nutrition on my recipes. However, there are online tools you can use to plug in the recipe ingredients to find out (my fitness pal is one). I’m not a fan of spinach so could you use basil leaves ? Basil might be too much in this…you can leave the spinach out and it still tastes amazing! I would love to make this for tonight, I have all the ingredients but we don’t like eggs at all. Can I skip the eggs? Skipping the eggs definitely changes the texture of this dish! I have never tried that, but if you do, let me know how it turns out to let others know! I can’t wait to get all the ingredients. Since this has veggies, I shouldn’t have any fat guilt eating more than 1 slice!!! Not a real fan of crescent rolls…I know…how unAmerican! They have a funny aftertaste to me! Anyway…thoughts on substitutions? Puff pastry…pizza dough…pie crust from Pillsbury? I would try pizza dough! Used to make a similar version of this for tailgate parties over 30 years ago. I would butter a pyrex casserole dish and then line the bottom and sides with the crescent roll crust. 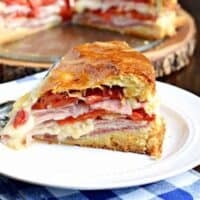 I layered provolone, genoa salami, mortadella, pepperoni, roasted red peppers, etc. and then poured the egg mixture over the whole thing, topping it off with the crescent roll crust. When it was completely cool I would cover the dish and take it along to the tailgate and then slice into large wedges. It was always a huge hit. 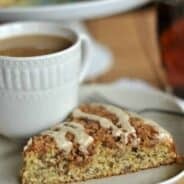 I am so glad I spotted this recipe because I will make it again for Super Bowl. This looks yummy! 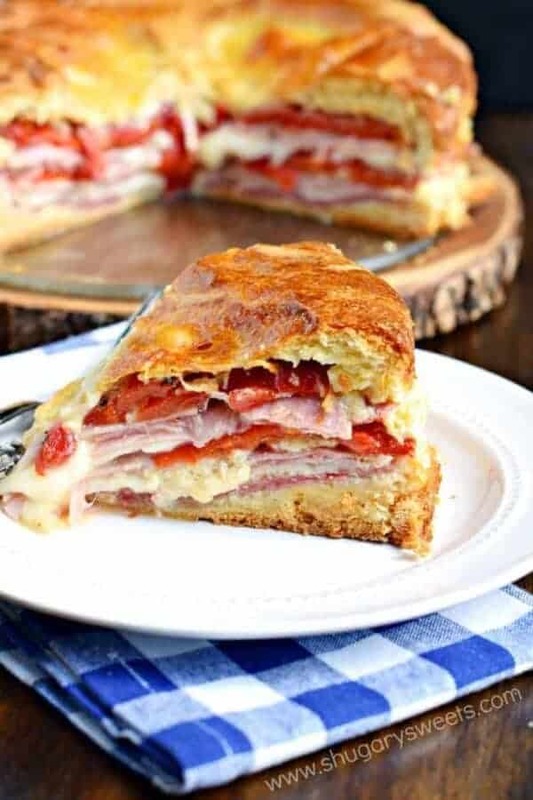 Im on a low carb diet, and thinking of making this in a jumbo muffin tin so I can keep my serving size under control! The flavor od this is amazing!!! I’ve made this several times but I have problems with the bottom crust being soggy and lots of juice when I cut it into slices! Any suggestions? Could be the extra juice from the red peppers, or the size of the eggs. You can cut back on the number of eggs and see if it helps! Not a fan of peppers , would tomatoes work ? Sun dried tomatoes would be lovely, even slices of fresh tomatoes would be fantastic! Do you use grated Parmesan in a can or the fresh shredded kind? I too had an issue with there being too much juice and the bottom crust being soggy. I dried the peppers based upon the comment above so I am attributing it to my eggs being too large. Loved the flavor and I will make this again for sure!!! Thank you Aimee!!! I just finished making this and I can’t wait to try it. The only thing is that I would caution the use of a springform pan because half my eggs ran out the bottom. I guess I wasn’t aware that they are not seal proof…booo and a pain in the rump to clean up eggs off the floor and countertops.